Spring into Cruelty-Free Beauty with Vegan Cuts! It’s always a good mail day when the Vegan Cuts Vegan Beauty Box arrives, as it’s loaded with the best cruelty-free beauty products! 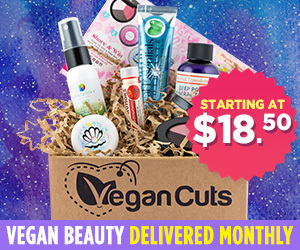 The Vegan Cuts Vegan Beauty Box is a subscription service that delivers a box of cruelty-free beauty products to your door each month. 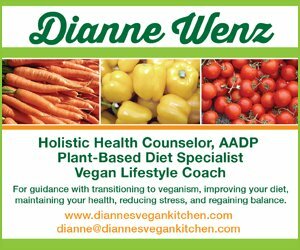 You never know what kind of lotions and potions you’re going to find inside, but it’s guaranteed that everything will be vegan. Most of the products are all natural, too. Products can be full sized, as with this month’s Obsessive Compulsive Lip Tar and Dr’s Remedy Nail Polish, or they might be trial sized, like the Youth to the People Cleanser. 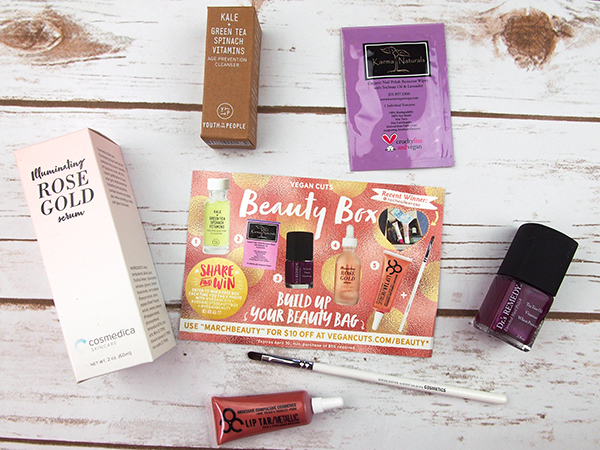 A subscription to the Vegan Cuts Beauty Box means you’re always able to try new products and discover new brands without spending a ton of money. 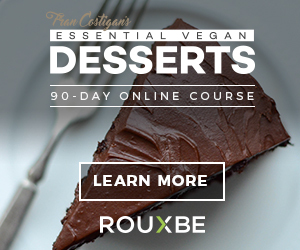 It’s perfect for new vegans who are just getting started in the world of cruelty-free beauty. 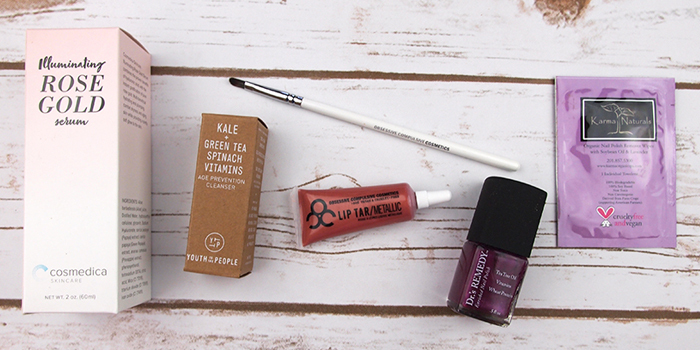 This March Vegan Cuts Vegan Beauty Box was all about getting ready for the warm spring weather! Obsessive Compulsive Cosmetics Metallic Lip Tar – I’m a big fan of Obsessive Compulsive Cosmetics, and I try to stop in their New York City store whenever I’m in the area. I’ve been using their Lip Tar for years, so I was excited to find a tube of a color I haven’t tried yet in this month’s Beauty Box. If you’re unfamiliar with Lip Tar, it’s simply liquid lipstick. It goes on like a gloss and then sets and stays put for hours. Really, it doesn’t wipe off after drinking cups and cups of my morning tea, and it still looks fresh after eating lunch. It comes in a tube with a brush, which makes it easy to mix or layer colors. I received the color “synth,” which is a pretty, shimmery rose gold. This color will be getting lots of wear this sping. 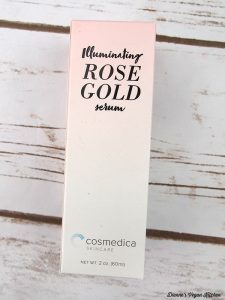 Cosmedica Illuminating Rose Gold Serum – Speaking of rose gold, this month’s Beauty Box also contained Cosmedica’s Illuminating Rose Gold Serum. 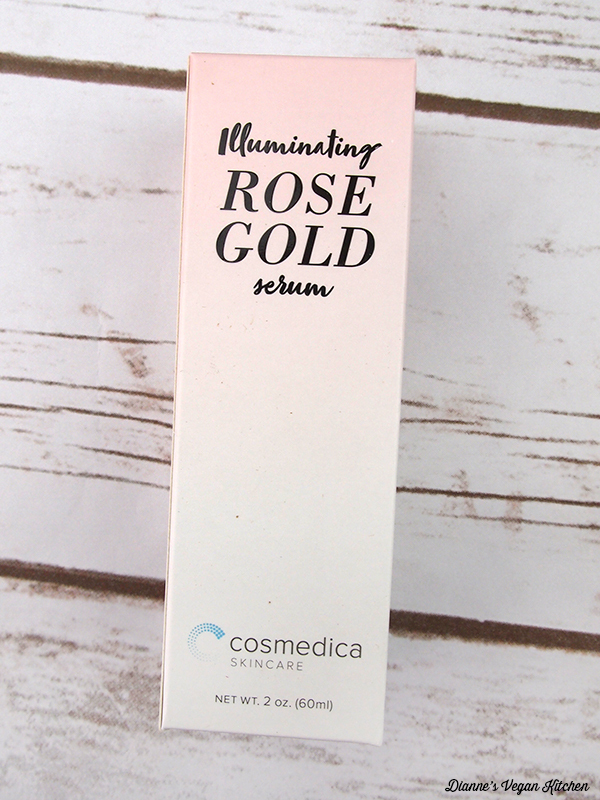 This shimmery serum adds a light glow to the complexion. It can be worn under or over makeup on the high points of the face, or wherever you want to add a little bit of sparkle. It’s formulated with aloe juice, papaya, and pineapple, and it also hydrates and plumps skin. Youth to the People Age Prevention Cleanser – Made with kale, spinach, and green tea, this cleansing gel is almost good enough to eat! The ingredients in this cleanser help to remove dirt and toxins while also protecting the skin from free radicals and environmental stressors. My face has felt soft and supple after washing with it. Not only do I love what’s in this little bottle, I also love what isn’t in it, as it’s free from parabens, added fragrances, sulfates, and phthalates. Dr’s Remedy Enriched Nail Polish – This polish was formulated by podiatrists after noticing that many of their patients were suffering from brittle, discolored nails, which was caused by the harsh chemicals found in nail polish. 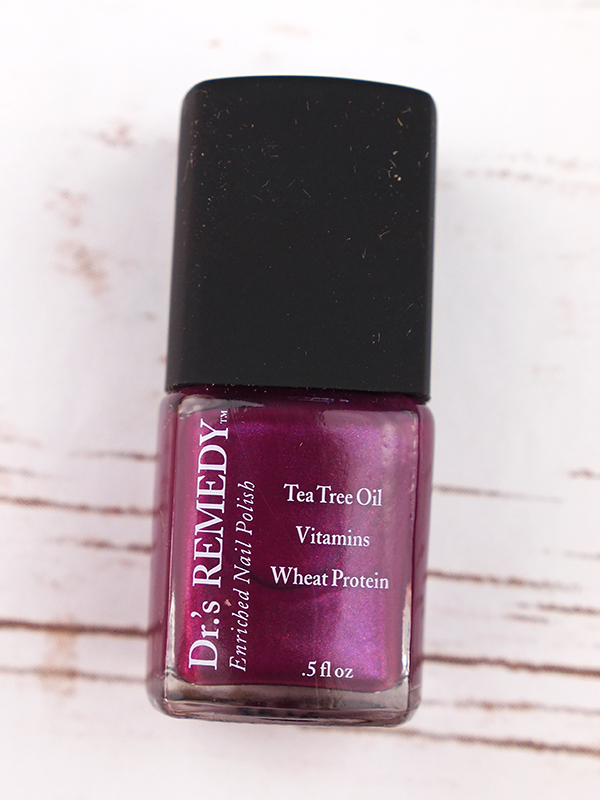 This polish is formulated with wheat protein, tea tree oil, garlic bulb extract, lavender, and vitamins C and E to nourish nails. 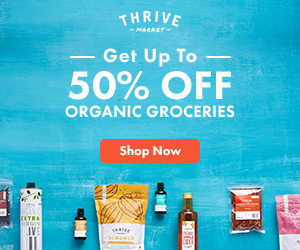 Of course it’s free of the nasty chemicals that are not only harmful to nails, but to the entire body, such as formaldehyde, toluene, and phthalates. I received the color “passion,” which is shimmery violet. It looks great on my toe nails, and I’m looking forward to sandal weather when I can show them off! Karma Organic Nail Polish Remover Wipe – When you’re ready to remove your nail polish, this wipe from Karma Organic is ready to do the job. I’ve been using their nail polish remover for years, so I was happy to find this wipe in this month’s Beauty Box. Drug-store brand polish removers smells so awful that I’m sure I’m poisoning myself when I’m using the, but Karma Organic’s removers are non-toxic and non-carcinogenic. After using drug-store brands, my nails would always feel brittle and they’d start peeling or breaking, but not with Karma Organic! Their remover is soybean based, and it contains vitamin E to nourish nails. It is free of acetone, petroleum products, and other nasty ingredients. I love that they also offer this handy wipes, which are perfect for travel. 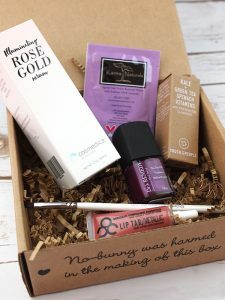 The Beauty Box is available as a monthly subscription, which means that once you sign up, a box of new goodies gets delivered to your door every month.